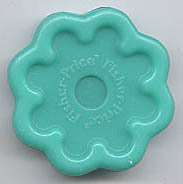 Description: Blue plastic cookie that is round with scalloped edges. The cookie is marked "Fisher-Price" in a circle around the center of the cookie. The center of the cookie has a round indention. Measures 2-7/16" diameter and 1/2" thick. 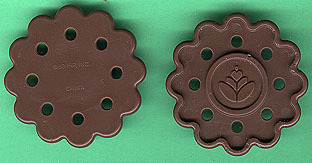 Description: Dark brown (chocolate) cookie that is round with scalloped edges. 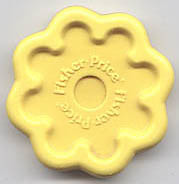 The cookie is marked "Fisher-Price" in a circle around the center of the cookie. The center of the cookie has a round indention. Measures 2-1/8" diameter x 7/16" thick. Marked, "MADE IN U.S.A." on back. Description: Dark brown round scalloped edge cookie half. One side of the cookie has 8 dots around the inside rim and a circle in the center. There is a small heart with 4 "leaves" under it in the center of the circle. The back side of the cookie is smooth. Measures 2" wide. Description: Light brown flattened foam-textured cookie dough gingerbread man that fits into the cut-out shapes in the FPT10085 cookie dough tray. 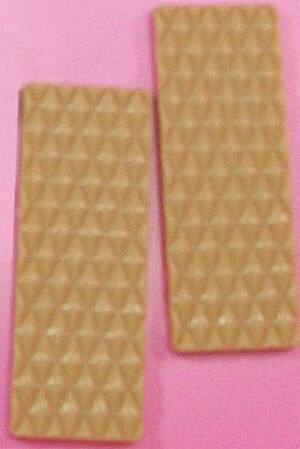 Description: Light Brown thin flat rectangular wafer cookie with a criss-cross square wafer design on one side. This resembles sugar wafer cookies. Description: Green plastic cookie that is round with scalloped edges. The cookie is marked "Fisher-Price" in a circle around the center of the cookie. The center of the cookie has a round indention. Measures 2-7/16" diameter and 1/2" thick. 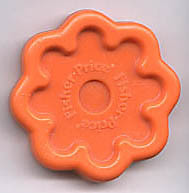 Description: Orange plastic cookie that is round with scalloped edges. The cookie is marked "Fisher-Price" in a circle around the center of the cookie. The center of the cookie has a round indention. Measures 2-7/16" diameter and 1/2" thick. Description: Orangish-tan plastic cookie that is round with scalloped edges. The cookie has 6 dots on the top. The cookies resembles a Ritz® Crackers. Description: Orangish-tan plastic cookie that is round with scalloped edges. The cookie has 6 dots on the top, and a bite missing from the side (appears as if someone bit the cookie). The cookies resembles a Ritz® Crackers. 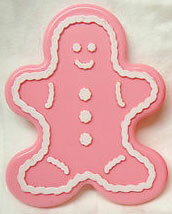 Description: Pink gingerbread man shaped cookie with white icing decorations on top. 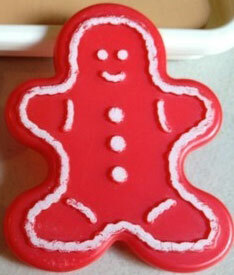 Description: Red gingerbread man shaped cookie with white icing decorations on top. Description: Red plastic cookie that is round with scalloped edges. The cookie is marked "Fisher-Price" in a circle around the center of the cookie. The center of the cookie has a round indention. Measures 2-7/16" diameter and 1/2" thick. 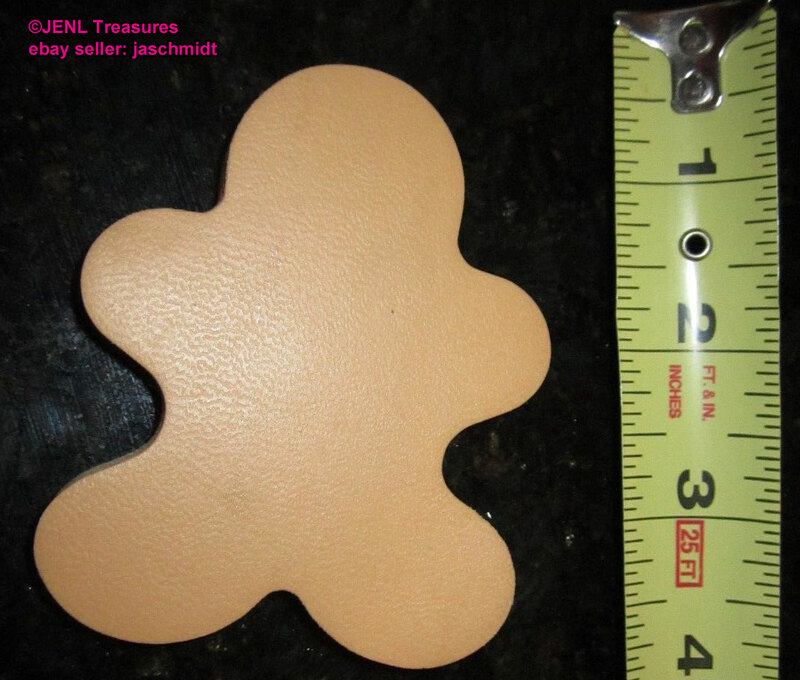 Description: Tan plastic cookie that is round with scalloped edges. The cookie is marked "Fisher-Price" in a circle around the center of the cookie. The center of the cookie has a round indention. Measures 2-1/8" diameter x 7/16" thick. Marked, "MADE IN U.S.A." on back. Description: White plastic cookie that is round with scalloped edges. The cookie is marked "Fisher-Price" in a circle around the center of the cookie. The center of the cookie has a round indention. Description: Yellow plastic cookie that is round with scalloped edges. 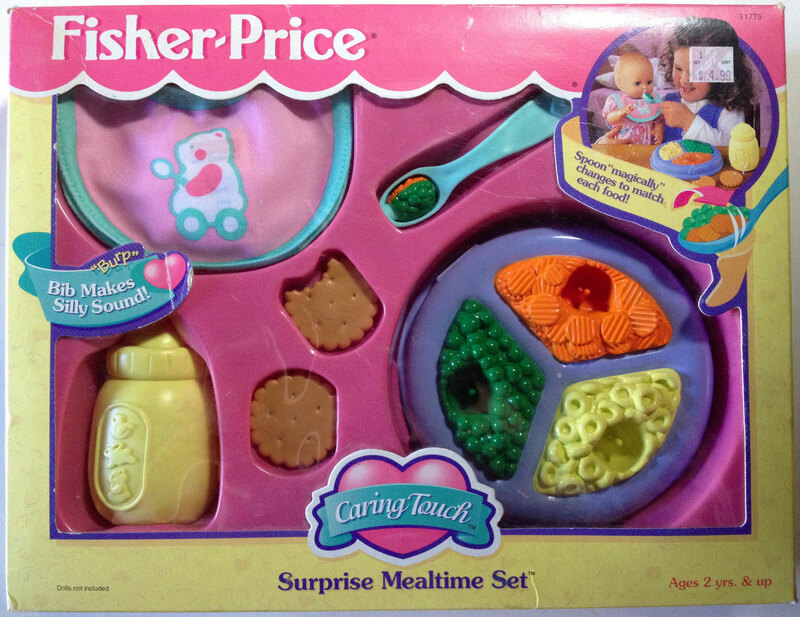 The cookie is marked "Fisher-Price" in a circle around the center of the cookie. The center of the cookie has a round indention. Measures 2-7/16" diameter and 1/2" thick.